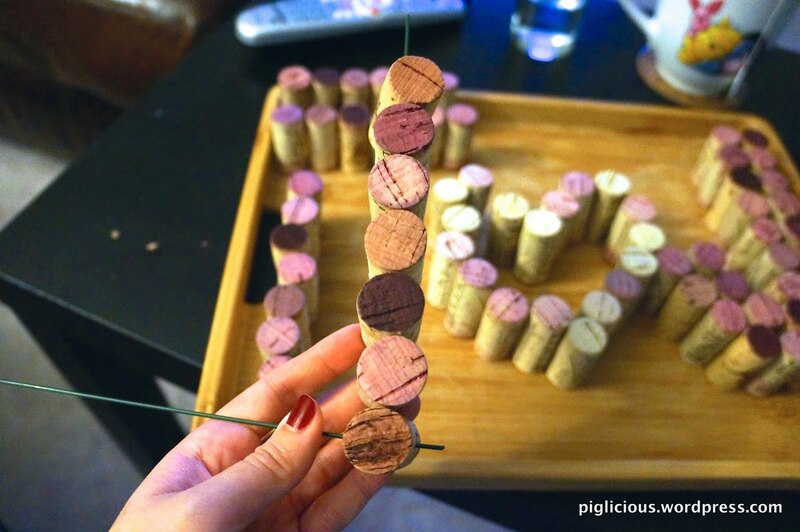 My fiancé and I are getting married later this year at a vineyard, so I started to research what DIY crafts I could make for our wedding decorations! 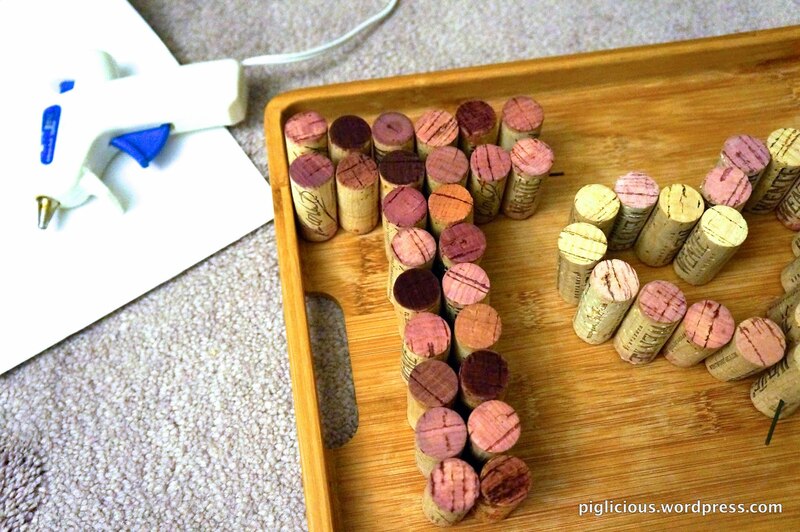 :) I came across many cool DIY wine cork crafting ideas on Pinterest and decided to make one with our initials. 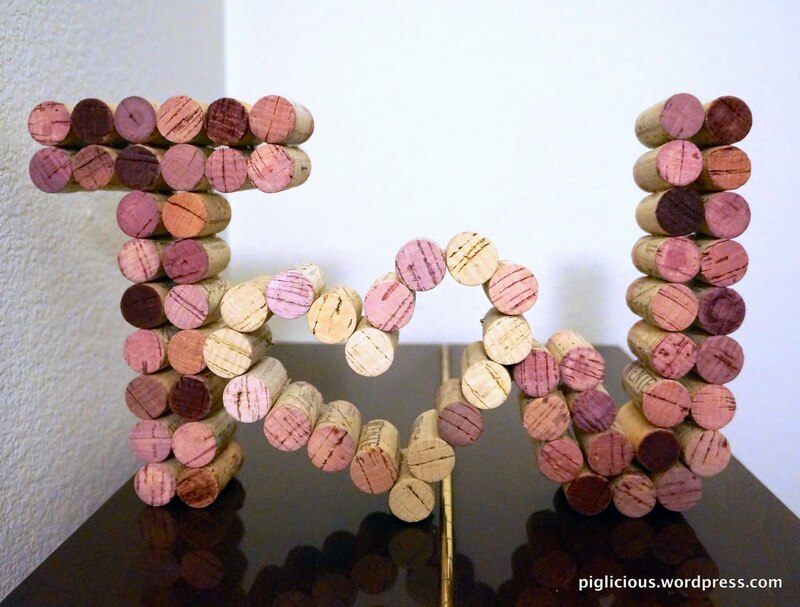 There are many letter designs that use a cardboard cutout as the backing where the bottom of the corks are glued onto the cardboard, but I liked the look of the light going through the corks more, so I decided to go with that kind of design. 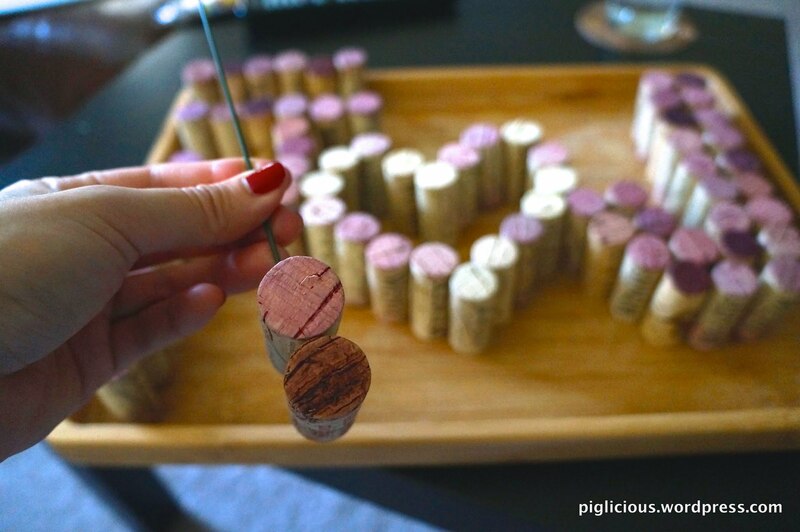 At first, it seemed easy enough–put the corks in the formation I want, connect them with some wires, and hot glue gun the pieces together. That’s easier said than done. After some trial and error, I finally got it to work. I initially used a thin wire since the lady at Michaels recommended that. Nope, didn’t work. My initial came out floppy. I did some more Googling and couldn’t seem to find what others use to make these corks stand stably. I then bought these floral wires on Amazon to experiment, and they worked! First, form the letters and heart for the way you want them to look. Start from the inside vertical row of the T. Measure with a ruler (I measured 7/8 inch) and poke the holes in the cork for where you want the wire to pass through each cork. 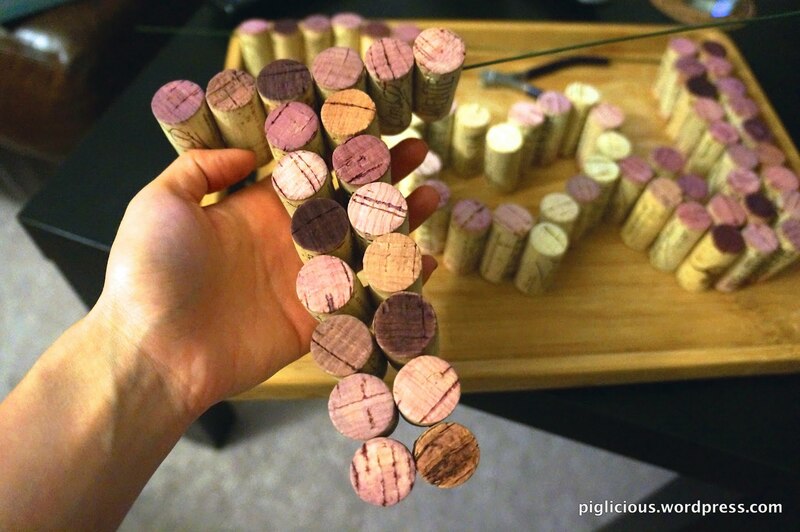 Do not poke the wire all the way through the bottom cork since you don’t want the wire to show on the bottom, and you want the cork to stand evenly straight next to the other row. Continue to wire through the 2nd to the top cork. Then cut the wire just enough so that when you poke the top cork, it won’t go through entirely. Now we go to the outer row of the T. Measure (this time at 1 inch) and poke the wire through. 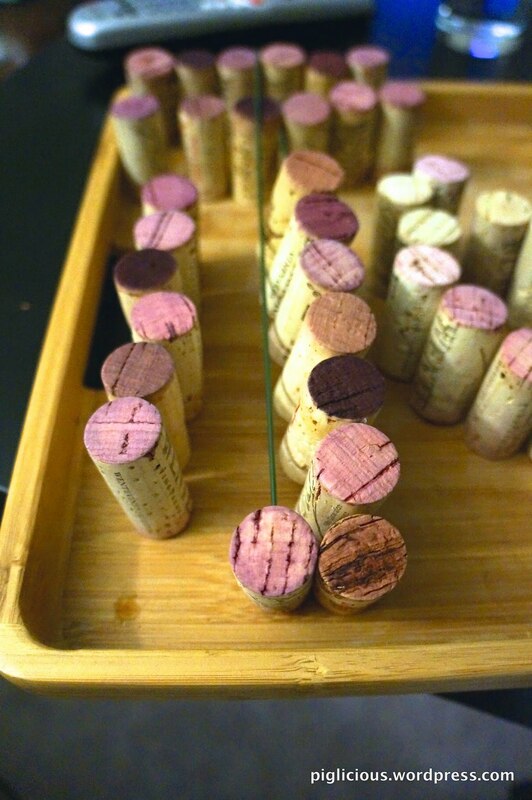 Continue to wire through the 2nd to the top cork and do the same as the other row–Cut the wire just enough so that when you poke the top cork, it won’t go through entirely. Now wire the bottom horizontal row of the T. Start from the left side. 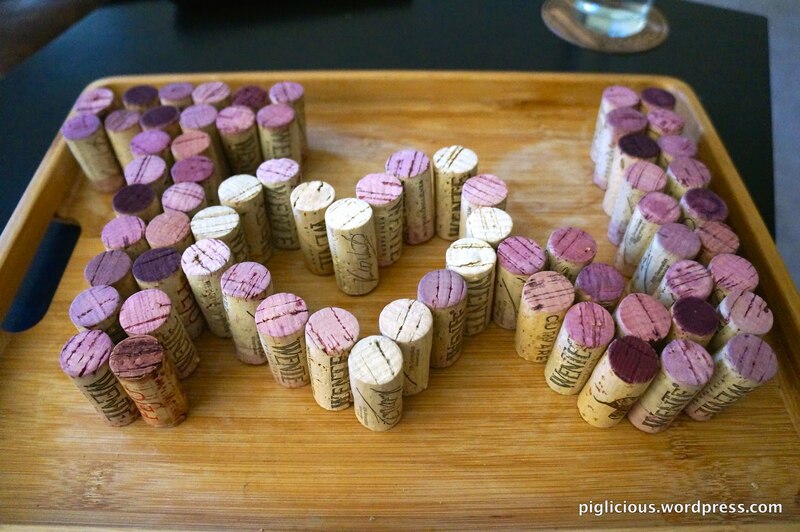 Don’t poke a hole all the way through for the far left cork and wire through the rest of the corks. Cut the wire leaving about 3.8 inch. You’ll notice that there are 2 corks on each side at the top horizontal cork layer, which will just be glued on later. Continue and wire the heart and J. For the heart, wire through the hole heart with the ends of the wire meeting at the bottom of the heart. Bend the ends of the wire to secure the heart. 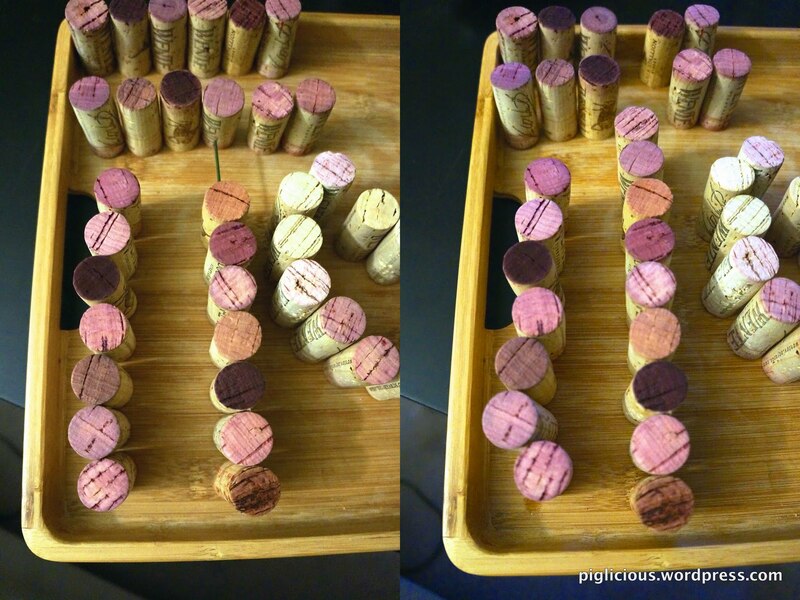 For the J, only wire the outer cork layer. Leave about 1.5 inches of wire at the end of the hook (to connect to the heart) and like the T, do not wire through the last cork at the top. 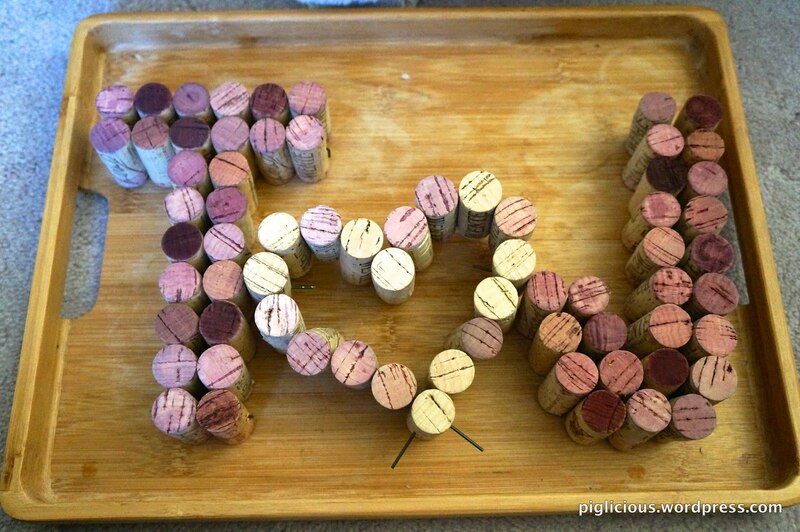 In order to connect the “T,” “<3,” and “J” together, poke a piece of wire (about 2.5 inches) on the left of the heart to connect to the “T” and make sure to poke a hole through the connecting cork on the “T.” Doing this beforehand will be easier to connect them later. On the right side of the heart, poke a hole through the connecting cork and the 1.5 inch wire on the “J” should be used to connect to the heart. Now that all the necessary corks are wired up, we hot glue the corks together. Start with the “T.” Unfortunately, you will have to take apart the “T” in order to glue the right vertical row first and insert the wire that will be connecting to the heart. Bend that wire to secure it’s position. Glue the left vertical row and then glue the rows together. Finish gluing the top portion of the “T” and bend the wire of the lower horizontal row. Continue and glue the heart together. Then go on to the “J” by first gluing the outer layer first and then glue the rest of the inside layer to the outside layer. Now you can insert the “T” to the “<3” and “J” to the “<3.” Once these pieces are all connected, bend the wires that have been poked through the heart! And you’re finally done.